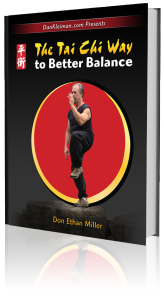 Don was four-time national Champion in Tai Chi Tuishou (Pushing Hands) competition, and has taught thousands of people in workshops and classes across North America. Don is also a prize-winning poet, non-fiction author, and screenwriter. He regards it as his mission to bring authentic, powerful, non-form based internal arts to the world through a variety of media, ranging from instructional DVDs to inspirational calendars, master classes, e-books, and feature films. He may be reached directly at DonMillerTaiChi@gmail.com. Three Special Offers from Mastodon Productions! Volume One Complete: Old Hand Kuntao/Ten Forms/Monkey!/Chi Kung The perfect gift for any martial arts enthusiast. Finally, the complete Volume One of the acclaimed Master Tapes series is available in a Limited Edition Boxed Set, containing more than four hours of incredible instruction and demonstration of Kuntao Silat De Thouars by "Uncle Bill" himself. See descriptions of individual disk contents below. SPECIAL SALE DISCOUNT: the complete set is available for 20% off (a $30 discount), for only $119.95. Choose any one of the 4 DVDs to complete your set. Price includes 1 DVD and limited edition box. 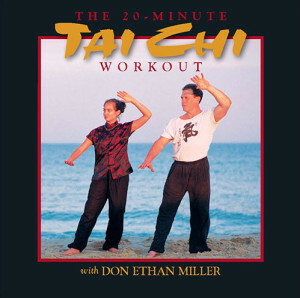 The indispensable set for practicioners of Cheng Man Ching Tai Chi and all serious Tai Chi players. This beautiful four DVD box set has been universally acclaimed and contains material kept within the Cheng family for over 35 years before being released to Mastodon Productions in 2008. Originally priced at $149.95, the set is now available, only from Mastodon productions, at the incredible price of only $99.95. Cheng Man Ching (Zheng Manqing) was one of the great Tai Chi masters of the 20th Century. His students include William Chen, Huang Shyen Shen, T.T. Liang, Ben Lo, Stanley Israel, Maggie Newman, and many others. A "Master of Five Excellences" he was also a renowned poet, brush painter, calligrapher, and Chinese medical doctor. In this rare collection of previously-unreleased tapes, Professor Cheng is seem teaching, pushing hands, fencing, telling stories, laughing, and demonstrating mastery in every gesture. The original footage of this remarkable man was shot at Cheng's Shr Jung school in New York City, between 1969 and 1971. "The tapes are amazing. They are an outstanding piece of history and should be in the library of anyone interested in the legacy of Cheng Man Ching. Thank you so much for producing such an inspiring set of tapes." -- W.B. This is not your grandmother's chi kung. This is the chi kung you do at three in the morning, while the rest of the world sleeps. This is the chi kung you do on a cliff's edge in a hurricane, in a slot canyon a hundred miles from civilization, among bare trees in a city park on a freezing January morning. This is the chi kung you do before going out to do battle; or upon returning, whether Defeated or Victorious. This is the chi kung of freedom, of spontaneity, of good energy, of authenticity and naturalness. This is the chi kung to dispel fatigue, tension, pain, fear, and disharmony. This is the chi kung to become like a child, like an animal, like a force of nature; like yourself. This is Willem's chi kung, the secret to his vitality, his martial prowess, his energy- longevity. Use it to find your own. In the third installment of the WDT Master Tapes, "Uncle Bill" demonstrates the mobility, speed, unpredictability, and ferocity of the monkey, one of the key components of the Kuntao-Silat de Thouars System. Not based on any of the "monkey kungfu" styles, Uncle's understanding of monkey energy and movement comes directly from his experiences with macaque monkeys growing up in java, including an unforgettable fight with a 60-lb macaque, the memory of which remains in his body to this day. 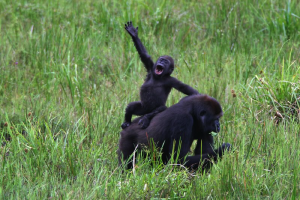 This amazing DVD includes over 40 separate segments of Uncle teaching monkey solo moves and sequences, ferocious combat applications, and basic exercises to "bring out the primate in you." In this extraordinary DVD, we introduce ten of the barehand training sequences of Kuntao-Silat, performed with unmatched energy and martial authenticity by Willem de Thouars himself. Culled from archival footage filmed from the late 1960's to the mid 2000's, this is a rare opportunity to discover the breadth and depth of this art, and the incredible variety of qualities it contains. Unlike the forms in other martial systems, KSDT forms are not fixed in stone: they change, they are meant to be practiced with a wide variety of qualities, intents, and energies , and sometimes with additions of jumps, turns, extra strikes, and the like. They are alive, not dead. The worst thing one can do is to perform a KSDT form without spirit, without presence, without putting fully yourself into it. As Uncle Bill constantly reminds us, it is not the movement or the technique that matters, as much as the energy and attitude behind it. And, remarkably, when one practices the KSDT forms in this manner, they give you back much more than you put in. You gain something unexpected every time. Willem de Thouars, known to his friends and students as "Uncle Bill", is one of the world's greatest living martial arts masters. Born in East Java in 1936, he has trained almost continuously in internal and external martial arts-- Chinese, Indonesian, and Western--for more than 70 years. Old Hand Kuntao Training introduces the methods by which Uncle Bill built a foundation of rooting, functional strength, mobility and explosive power that lasts a lifetime. Many of these training methods are virtually unknown today, not only in the West but in Asia as well. This is the first in a 12-DVD Series, WILLEM DE THOUARS: THE MASTER TAPES, to be released by Mastodon Productions, one per month, over the next year. 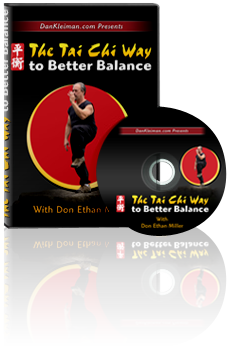 Join Tai Chi Master-Instructor Don Ethan Miller in a ground-breaking new book to increase your physical stability and overall well-being: The Tai Chi Way to Better Balance. Each exercise and key Tai Chi concept is explained in detail and organized in a safe, easy-to-follow progression of levels. You won't find out-of-context seminar footage, bad recording angles, or endless flowery forms on the Tai Chi Way to Better Balance DVD. Just as in the book, we recorded simple, direct explanations and demonstrations. You are an auditory learner who likes to follow GUIDED AUDIO instruction for each exercise. You learn by watching breakdowns of each EXERCISE IN MOTION (and stillness!). In ancient times, practicioners of Tai Chi and other internal/martial arts used rocks, logs, iron weights, stone balls, sashes, heavy staves and swords, and other forms of equipment to develop their gongfu—to enhance structural strength and alignment, increase ability to move swiftly and powerfully, and to develop a full array of jings—advanced ways of transmitting energy or force. In the modern era, however, most of these “old school” methods have been lost, in favor of empty-hand form work and perhaps push hands. 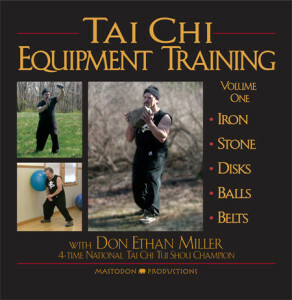 In this 90-minute DVD, Don Ethan Miller reveals both ancient and modern equipment training to enhance movement, rooting, speed, power, jings, and chi flow. You will be amazed at the almost-immediate improvement in your abilities. These rarely-seen training methods will enhance abilities of Tai Chi (and other Internal gongfu players) players of all levels. Upgrades guaranteed! This digitally remastered version of the acclaimed 1998 Mastodon videotape,"Stand Like A Tree, Move Like A River" includes over 2 hours of instruction, including two separate versions of the Workout in real time.